Sold: $910,000 #1807 1 bedroom, 2 baths, 1,405 Sq. Ft. Newly Listed: $1,350,000 #1210 2 bedrooms, 2 baths, 1,804 Sq.Ft. 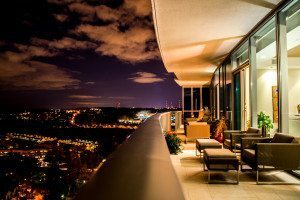 Rarely available, you can own a custom designed “D” unit at Turnberry Tower. This is a true 2 bedroom 2 full bath residence, with private elevator entry. Beautiful finishes dazzle throughout. Includes 1 garage parking space and storage unit. Newly Listed: $1,350,000 #712 2 bedrooms, 2 baths, 1,742 Sq.Ft. Another D-line with preferred and quiet western view. The sunsets are spectacular from the full-width balcony which creates great flow for entertaining. Warm hardwood floors throughout, accompanied by beautiful lighting and finishes. Five-star amenities plus direct elevator entry. Newly Listed: $925,000 #807 1 bedroom plus den, 2 baths, 1,405 Sq.Ft. This exquisite one bedroom plus den is deceptive by design — it feels like a 2 bedroom. Imported marble flooring throughout and a magnificent kitchen with Italian cabinetry, granite countertops, and Miele appliances. An identical unit ten floors up just sold for $910,000. Get your bid in early. Newly Listed: $829,500 #705 1 bedroom, 1.5 baths, 1,322 Sq.Ft. Great opportunity to own at Turnberry. Investor friendly price per square foot — $647.00. Spacious master en-suite with walk-in closet and balcony. Newly Listed: $799,900 #206 2 bedroom, 2 baths, 1,404 Sq.Ft. Newly renovated one bedroom, plus oversized den, perfect for your office or convert to a guest room. Unique stone/slate floor with radiant heating system underneath.